Samsung Pay, the South Korean electronics giant’s mobile wallet app, is now available on six continents (all but Antarctica) and 24 markets. South Africa is the latest country to receive Samsung Pay support. According to an August 21st, 2018 Samsung press release, Samsung devices owners have used Samsung Pay to make 1.3 billion transactions globally. Samsung is also working with approximately 2,000 banking and financial partners globally to offers services based on local needs. These services include online payments, transit cards, ATM transactions, Samsung Rewards and Pay Planner. In Canada — and 19 other markets — Samsung Pay even offers the ability to add loyalty and membership cards. Samsung also works with the broader payments industry and partners with major financial institutions, like PayPal and Chase Pay. Additionally, with Samsung’s help, Chase Pay and South Korea’s PAYCO use the company’s magnetic secure transmission (MST) technology allowing users to pay with legacy credit card terminals that still operate via swipe. 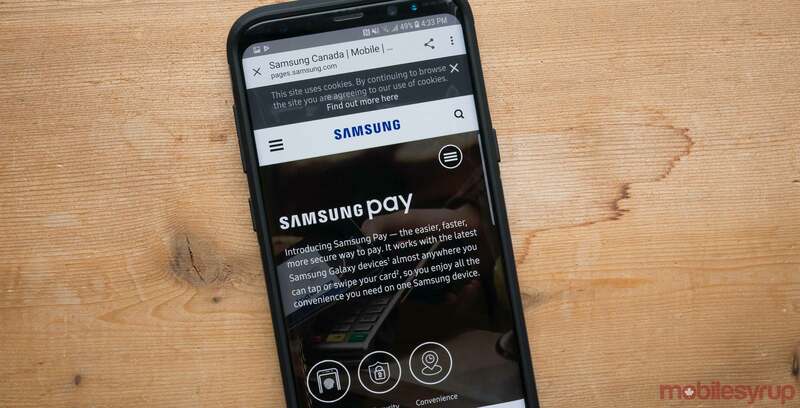 Samsung Pay is available on Galaxy smartphones, Gear and Galaxy smartwatches and other compatible Android smartphones via Samsung Pay mini — a service that’s not available in Canada.